Management of and protection from localised flooding is a rising concern for housebuilders, but suds and flood control doesn’t have to be only about moving water to safety. Sean Robinson of Polypipe argues that new housing estates provide the perfect opportunity to harness water as a resource. The summer conditions this year have turned swathes of green spaces within our inner cities and suburban estates into dry dustbowls, and highlighted the long-predicted challenge of resource management facing the country. 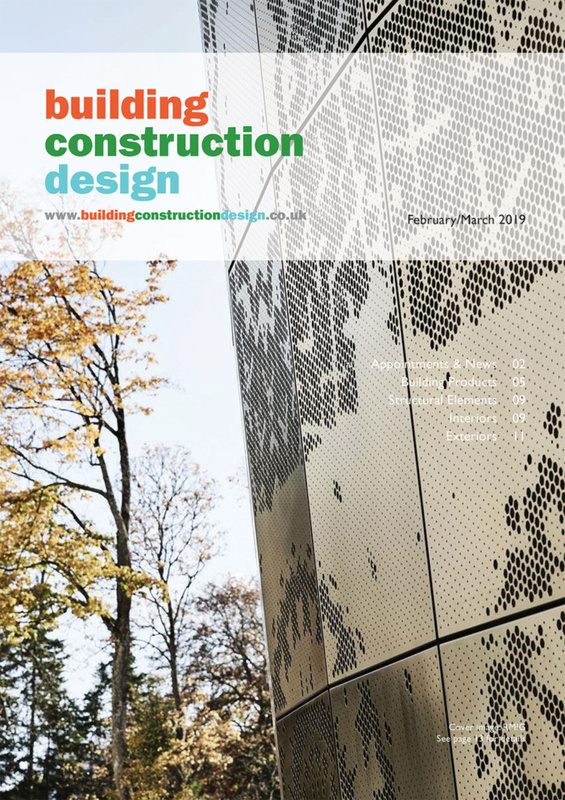 As weather in the UK becomes more extreme, solutions to harness the changing conditions need to be adopted more quickly by architects, planners, house- builders, and landscape specialists. Policy makers, urban planners and archi- tects are fully aware of the need to change the way rainwater is managed in urban environments. Some notable reports are encouraging greater focus on water management by all stakeholders in the building process. In July, the Westminster sustainable business forum (WSBF) released its ‘Bricks and Water’ report on housebuilding, water management and planning policy, which was followed in the same month by the latest National Adaption Programme on climate change being released by Department of Environment, Food and Rural Affairs, which requires local authorities to take greater account of climate change in their planning decisions. For generations, the received wisdom has been to manage water away from buildings as efficiently as possible to minimise long- term damage. But key factors are coming to a head that require a rethink in the relationship between housebuilding, city developments, and water management. With a change of mindset, driven by new research and guidance, developers have the chance to harness the storm water on a housing development as a resource to keep new estates and urban communal spaces green, and to help mitigate the strain our water supply will come under for the next generation. The first factor is the critical need for new houses to be built at an unprecedented rate over the next decade, to help the UK overcome its growing housing shortfall. A massive 1.5 million new homes has been pledged by 2022, but the Government is already struggling to deliver the momen- tum required, with 80 per cent of housebuilders predicting that the industry will fall short. If this target was achieved, a new problem would become apparent, as up to 2.5 million homes would then be situated in locations susceptible to flood risks. Thirdly, along with changing weather patterns that could leave our biggest water reserves struggling to service the country each year, the WSBF is predicting a severe swing from a ‘water surplus’ of 12 per cent to a ‘water deficit’ of 22 per cent by as early as 2050 – just over 30 years from now. The solutions to these long-term issues are already available on the market, but are being neglected by some housebuilders. 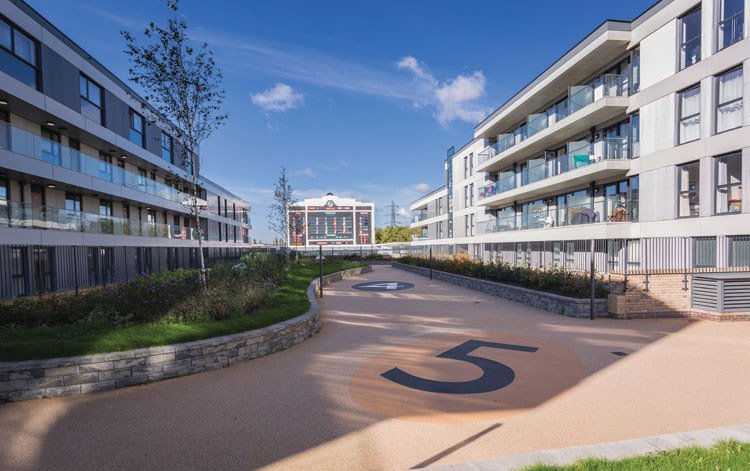 As the WSBF points out, the use of SuDS on new developments still hasn’t become the norm, with the industry preferring the use of legacy materials and tried and tested below ground solutions. 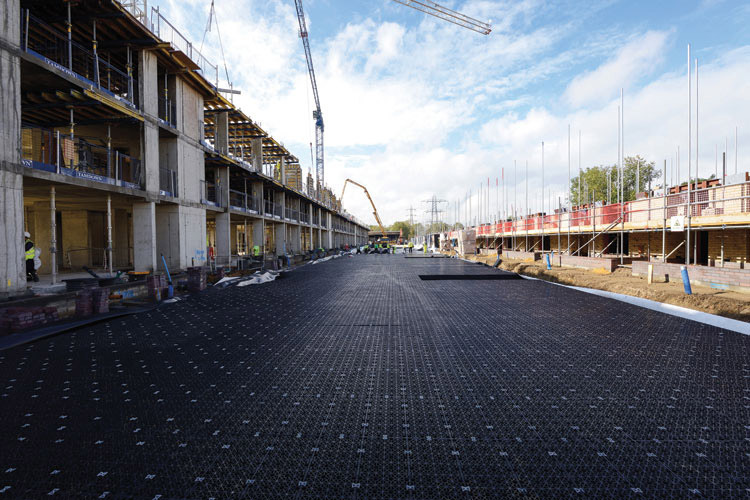 This is despite above ground green infrastructure solutions becoming more sophisticated, and up to 86 per cent cheaper than below ground systems. Fortunately, there are schemes in the UK where green infrastructure solutions have been designed as an integral part of the project. The proposed redevelopment of the Thamesmead in south east London will turn the borough of Thamesmead into one of the city’s most biodiverse and sustainable urban living environments. This large-scale redevelopment of one the biggest post-war residential schemes will serve more than 100,000 people living in 35,000 homes on the banks of the Thames. Developing new housebuilding with the intelligent use of water at the heart of the design is not just about aesthetics and the environment. It can help to generate value and demand in the homes built and provide widespread protection. 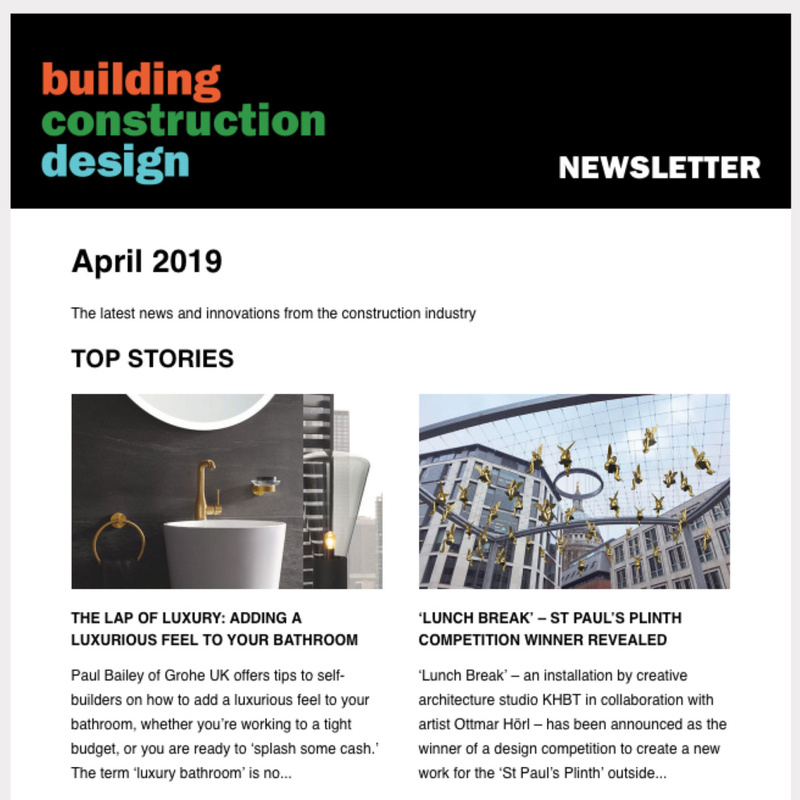 The University of Cambridge has encouraged the building of a £1bn sustainable commu- nity that uses some of the innovative sustainability features. The Eddington community is built around manmade lakes designed to hold six million litres of water, while protecting the surrounding villages from the frequent flooding the residents used to endure. According to a recent report in EDIE.net, The North West Cambridge Development team claim that Eddington is home to the largest water recycling system in the country. Any collected water is pushed through a site-wide SuDS system to be used for non- potable uses such as flushing water and irrigation. The further benefit is that the water recycling system will cut water consumption onsite to 80 litres per person, almost half the average across Cambridge which is 50 litres. 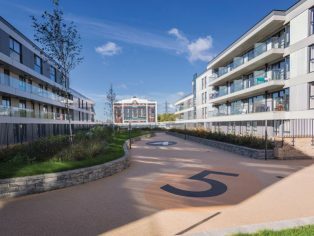 In both examples, the designers and developers behind the masterplan are only using the solutions and systems that are already on the market, which demonstrates the versatility of options available to housebuilders and specifiers. Despite facing the pressure to build, alongside the need to keep homes safe from changing climate conditions, and the need for more investment in the vulnerable parts of our water infrastructure, these examples also demonstrate the opportunity which lies in front of developers. Through the adoption of ‘green infrastruc- ture’ developers can redefine the experience of living on housing estates and the shape of suburbia for generations to come.